We have discussed The Importance of a Home Yoga Practice as well as, Private Yoga Classes but today, let’s move into the studio, or group practice. I say studio or group because, you do not need to practice in a studio to practice in a group. There is a difference in practicing in a group setting than privately or alone. Have you ever gone to a very early yoga class? Sleepy eyes all around, quiet, people are even walking in and unrolling their mats softer. As the class fills, before it even begins have you ever looked around and observed the difference, if not than perhaps just within yourself? Ok, say you have had a terribly stressful day at work, you sign up for a class right after, heading there traffic is beyond bad. You arrive and have trouble finding a parking spot. You are trying to stop gritting your teeth as you walk into the studio where even that is packed. They make room for you, you unroll your matt and prepare for class. Do you feel the shift? The difference is the people! You need the studio or a group for people! The beauty of practicing yoga in a studio or in a group setting is the energy within this group. The energy is what then shifts yours, your vibrations align. 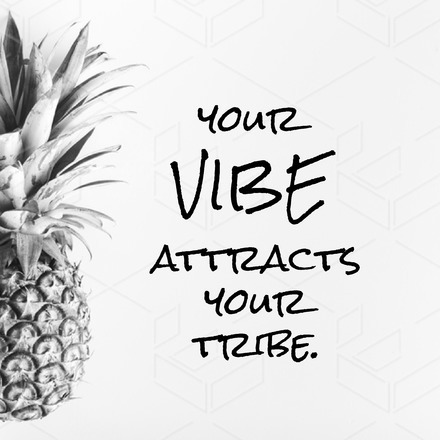 Oh, c’mon, we have all heard, “your vibe attracts your tribe”. Try it next time. Wake up early, even on the weekend, for that yoga class. Go to the evening class after the day from hell when all you want is wine and your bed. See if by the end your tone, outlook, feelings, your vibes, have not changed. Sometimes all we need is others positive vibes to aid our own.